While Shadowrun Returns did a lot of things very well, particularly in the writing, it didn’t quite offer the freedom that its tabletop forebear was known for. Its expansion, Dragonfall – a proper expansion like the ones found in ye olden tymes – made strong moves in that direction though. A big hub to explore, lots of optional quests, a proper cast of party members who don’t mind a bit of a gab – it was quite the improvement. And now soon you’ll be able to pick it up as a standalone. 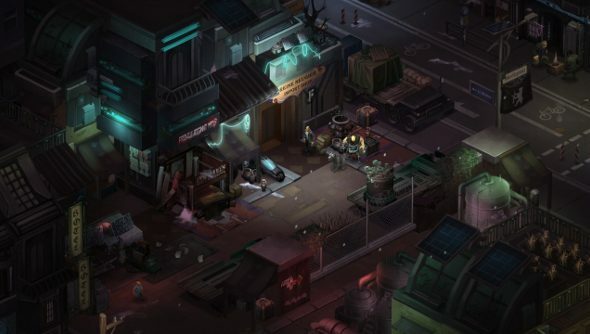 Shadowrun: Dragonfall Director’s Cut will come with the expansion’s campaign, five new missions and a slew of changes and new features that might even make it worth dipping in a second time. It’s free if you own the expansion already, too. So what you get with Dragonfall Director’s Cut is a cracking campaign, where magic and tech collide with corporate espionage and dragons; five new missions, some of which are connected to the back stories of your motley crew of shadowrunners; upgraded combat and AI, where cover and damage mechanics have been fiddled with; a new interface; and – at long bloody last – party customisation. Hairbrained Schemes could have probably just released the standalone with bugger all new content and not a single eyebrow would have been raised, so it warms my cockles to see all this bonus content. I picked up Dragonfall a while back, but never got around to finishing it thanks to some very silly decisions I made while levelling up my magical hacker. This will definitely be the impetus I need to jump back in and start fresh. The Shadowrun Editor comes with this version too, and includes assets from both Returns and Dragonfall. If you’re not interested in the neo noir campaign, Dead Man’s Switch, from Shadowrun Returns, then you’re not going to miss out by only grabbing the standalone. It’s due out on Steam come September 18th.